That Dacia looks really smart actually. With a decent polish and a little fettling it could look like new...but not TOO like new. White is a tricky colour to get a decent shine on, but does look really good when it's done. It's one of those estate cars that is just really pleasingly proportioned I think. Surprisingly fly-free on the front of it! Some cars seem to do that surprisingly well. The Lada rarely seems to get much splattered on it, despite it doing just the same speeds as most things save for the 100+ club on the motorway. The Renault 11 I had was by FAR the worst car I've had for it, especially the flat plate just above the radiator grill. Used to find that after a couple of days commuting to college that I had to manually clean the windscreen as I seriously couldn't see out of it. The Pug 405 windscreen washer jets I fitted did help though. Same interior door handles as my Renault 6. Lada Riva. There's number 4. Hooray, I figured part of the picture viewing problem out, finally. Got to enjoy the condensed version updates. I bet there's a german word for "jealous but also really glad I didn't do that", because that's how this thread makes me feel. Superb effort gents. Riveting reading. I hope so. Pressure is on! This thread has me thinking as to what shite we saw when we had a two week holiday in Romania. Did Constanta, Bucherest and Brasov. I know I took lots of pictures of the transport shite which I can probably put my hand on and there must be a bag of pictures in the loft as well. Oh, the year we went there ? Two years after the revolution, 1991. Oh and I've been invited to Daciafest in August! Is it held in Romania? Holy f***ing shot balls - omgwtf - etc... truelly amazing job chaps. The gf has just sat glued to this as I play catch up...... she is half polish and did comment - with beards like that and a Romanian car they're in for a looooong trip. But did giggle when another 'pull' came up. I'm now in the doghouse though - How come they can get a car all th way home like that and yours go missing only twenty kilometres down the road? Glad to see you made it home driving it, without need for RAC assistance and all in one piece. I am tempted to call dibs on it when you'll want to sell it, just to make it a round trip. And you're definitely sure that 'Hub Nut' doesn't translate as 'ACAB' or something in various Slavic languages? Still, old car + unconventional appearance = regular police interest, as my teenage self learned quickly. What a tale, though! Once again, the boundaries of shite possibilities have been bent out of shape 4EVAH. This place just keeps getting better and betterer. I'm sure DW and Cats would love the chance to reaquaint themselves with the plod again. Keep the updates and pics coming please. Howsabout popping up to Bergen, getting the ferry to Lerwick, then to Aberdeen and you can drop into shitefest on your way home. Should only add about 3000 miles. Sadly that route hasn't run for years, Immingham to Ebsberg is the most northerly crossing these days I think. Back on topic - hats off to Cats and DW most impressive. Gave it a wash. I think it deserved one. The paint is terrible, in many places. I suspect this car would last about five minutes in regular daily use. Fortunately, it hasn't rained in Wales for weeks. When you say bad how do you mean? Has he gone at it with a brush and some emulsion? Or does if just need a flat and polish? is it only on the saturday? Different bits seem to have been repainted in different ways. Some older paint seems to have cracked in places. Getting this car mint would be a complete nightmare that would result in a full respray I reckon. 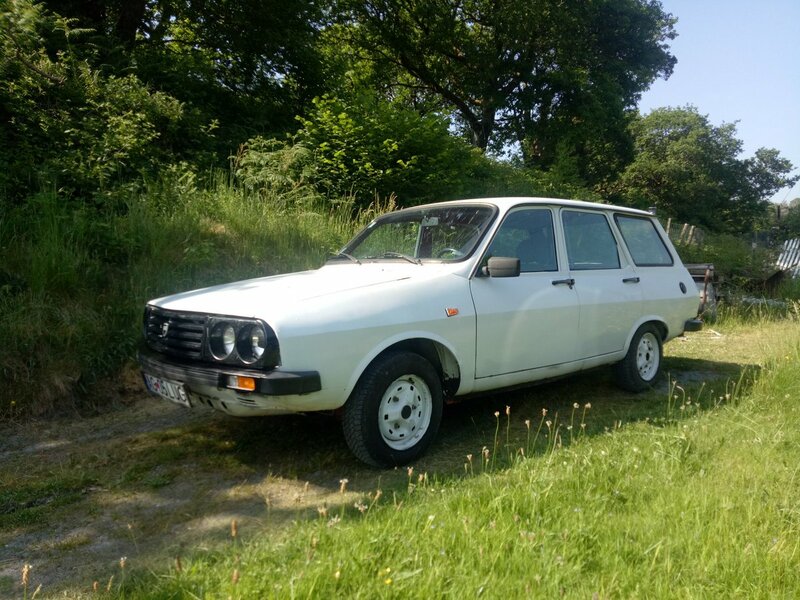 However, in the spirit of where it is from, and the limited resources of Dacia 1310 owners when these cars were current, I think I'm just going to try some local improvements with zinc primer and rattle cans, or touch up paint in places. There are some odd rust spots on the roof for instance. Why all the police tugs? OBV not speed related- is it the supposed country of origin, the car or the look of the occupants? Some sort of anti-beard agenda?! At this rate the Dacia will be reduced to component form by customs. Nobody likes the Roma, they both look out of place, the police are probably expecting to clear up every robbery/ theft in the area every time it gets stopped. NOVA declaration completed. Am considering a pre-MOT next week to see what we need to sort out. Rear seatbelts ARE required in vehicles after 1986. It doesn't have any mounts, so my thoughts are seat removal for the MOT, but then get some belts fitted at a later date. Let's face it, they're not a bad idea are they?